Description: Jenkinson's is a business categorized under candy & confectionery-retail, which is part of the larger category candy nut & confectionery stores. 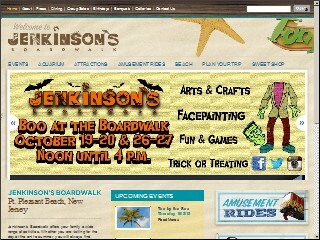 Jenkinson's is located at the address 300 Ocean Avenue #2, Point Pleasant Beach, NJ 08742 in Pt Pleasant Bch, New Jersey 08742-3261. The President is Mary Storino who can be contacted at (732)892-7576. Location & access map for "Jenkinson's"